Fire in World of Warships is a damage-over-time effect that occurs due to damage taken from enemy high explosive shells or aircraft bomb hits. Fire is represented visually by flames spewing from the deck or superstructure of a ship, as well as by flames along the edges of the in-game user interface. Ships can sustain multiple fires simultaneously; each part of a ship that is on fire increases the amount of damage that a ship suffers per second. The "Set on Fire" ribbon is awarded for setting fire to an enemy ship. A high explosive shell (enemy or friendly) from a main or secondary battery. An aircraft bomb (enemy or friendly). A "Set on Fire" ribbon is awarded for each individual fire set on an enemy ship. Every ship has four distinct zones along its main deck that can be set on fire, fore, aft, and two amidship. Thus the maximum number of fires on a ship is four. The commander skill Fire Prevention reduces the number of fire zones to three (one amidship). Fire Chance (the chance a shell or bomb will set a fire) is calculated by combining a base chance for the ordnance to set a fire, the target ship's intrinsic resistance to fire, and certain modifiers, as shown below. Each ship hull has an intrinsic resistance to fire. The amount of resistance is based on ship type, ship tier, and the hull that is currently equipped (Stock or Top). (Premium ships all have the Top Hull.) This resistance is expressed as the Fire Resistance Coefficient (FRC). The lower the coefficient, the more resistant the ship is to catching fire. The user interface will display several different indicators to let captains know their ship is on fire. The timer shows only the duration of the most recent fire set. "Projectile Base Fire Chance" is displayed in the Port screen by mousing over the Main Battery or Secondary Armament entries in the Artillery section. Only HE shells have a Fire Chance. In addition, each ship entry in this wiki includes the fire chances for main and secondary HE shells. For aircraft bombs, the base fire chance is a fixed number based on the size and type of ordnance used and varies between 0.087 (for the 40 lb. bombs carried by Hermes) and 0.64 (for the 2000 lb. bombs deployed aboard Midway). See the Aerial Combat page for more info. FCB is the Projectile Base Fire Chance; see Base Fire Chance above. As an example, we can compare the chance of a single Benson high explosive shell lighting a fire on an enemy Bismarck. The Tier VIII Bismarck is using Hull B (Top) (FRC of 0.6337) and Damage Control System Modification 1; his commander is not skilled at Fire Prevention. Benson fires 127mm HE Mk. 32 with a 5.5% base fire chance. Her commander is a Demolition Expert (not IFHE) and is flying both the Victor Lima and India X-Ray signals. The above example can be used to demonstrate the usefulness of the Demolition Expert skill on certain ships, especially those with a high rate of fire and a low individual fire chance per shell (such as Atlanta, Gearing, or Akizuki). 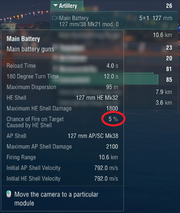 A shell's base fire chance can be found by hovering the mouse over the Main Battery information in the Port screen. Damage dealt by each instance of fire on a ship is fixed as 0.3% of its total health pool per fire per second (0.4% for aircraft carriers). Each fire has a base duration of 60 seconds for battleships and aircraft carriers, and 30 seconds for cruisers and destroyers. A fire that is allowed to burn for the full duration will consume 18% (0.3% x 60 sec.) of a battleship's maximum health, 9% of a cruiser's or destroyer's maximum health, and 24% (0.4% x 60 sec.) of a carrier's. There are currently four exceptions to the above fire duration for cruisers, the large cruisers: Tier VI Admiral Graf Spee and HSF Admiral Graf Spee has a base fire duration of 45 seconds. The Tier IX Kronshtadt, Alaska and Azuma and Tier X Stalingrad have a base fire duration of 60 seconds. Maximum fire damage is thus 13.5% (0.3% x 45 sec.) for the German Tier VI, and 18% (0.3% x 60 sec.) for the Tier IX and X.
Captains of battleships and large cruisers can quickly see, then, that while one fire might be considered a nuisance, two or more are a major threat to the ship. Ships that are on fire have their surface detection range increased by 2.0 km and their aerial detection radius increased by 3.0 km. This is particularly noteworthy for destroyer captains. Aircraft carriers that are on fire cannot launch or recover aircraft, unless their commander has trained the Emergency Takeoff skill which allows planes to take off and land while the flight deck is on fire at the cost of double the servicing time. Equipping Damage Control System Modification 2 ( ) will reduce the duration by 15%. Flying the India Yankee ( ) signal will reduce the duration by 20%. Each of these effects stacks with the others; however, they are multiplicative rather than additive. For example, if all three reduction effects are stacked, the duration of a single fire on a battleship or large cruiser is: 60 seconds x 0.85 x 0.85 x 0.80 = 34.68 seconds. The below tables provide the fire durations and total health loss for the different combinations of the above three effects. All damage sustained by fires is 100% eligible for recovery by ships that can use the Repair Party ( ) consumable. Note that a standard Repair Party heals up to 14% of a ship's base health (16.8% with the India Delta ( ) signal) over 28 seconds, comparable to a single fire on a battleship depending on other modifiers. ↑ Note that the Fire ribbon is also awarded when a fire would have been set but is not because of a Damage Control Party ( ) immunity period.